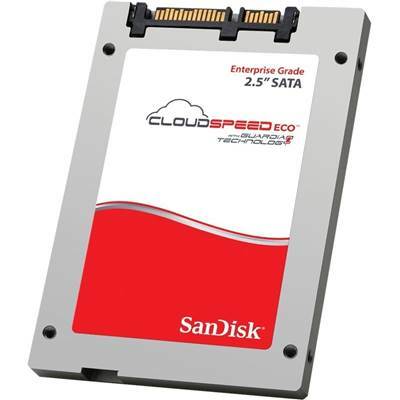 SanDisk CloudSpeed Eco SDLFNDAR-240G-1HA2 Internal Solid State Drive (SSD), 2.5" Form Factor, 240GB Capacity, SATA III (6Gb/s) Interface, 19nm cMLC, 2 Million hours MTBF. CloudSpeed Eco SATA SSDs are specifically designed for entry level enterprise, hyperscale, and cloud data center server and storage environments. Optimized for read-intensive application workloads, these SATA SSDs provide predictable high performance, excellent reliability, and low power consumption. They enable immediate access to data by delivering the high read-throughput and low latency required for consistent high quality of service (QoS) and meet the performance-to-capacity ratio requirements of cloud and data center environments. Photo sharing has become a major workload for social media sites - and for many email users. Initially, photos must be stored - but later accesses involve reading, rather than writing, the data on storage media. The longer the photo has been stored, the less frequently it is accessed, usage studies show. This is why archiving is important, while ensuring quick and easy access at a later time. SanDisk flash storage preserves the data on non-volatile memory for later retrieval - and provides high capacity that can be leveraged by service providers storing the photo images. SSDs support Internet traffic that enters the data center for processing by avoiding I/O bottlenecks. This enables fast processing by cloud service providers and accelerates end-to-end Web-enabled workloads. Flash storage supports high data transfer rates for the large datasets that are generated for movies, videos, and music and distributed via broadcast and the Internet. Flash also supports faster animation rendering and image-painting and enhances performance with near-real-time results. Cloud computing infrastructure is generally scale-out infrastructure, involving hundreds or thousands of small servers, arranged in a grid, cluster, or array. Applications and data are distributed across the cloud computing infrastructure-and software guides the motion of virtual machines (VMs) across distributed server resources in the cloud data center. SanDisk flash storage enables high performance for cloud computing workloads and ensures efficient processing for applications.